Newfoundland was settled by english fishermen as early as the 1500's and the St. John's dogs seemed to develop along with the fishing occupation. The english fishermen in Newfoundland used the St. John's dogs to retrieve fish that had fallen off their hooks as well as to haul in fishing lines through the water! It was said that these dogs would work long hours with the fishermen in the cold waters, then be brought home to play with the fishermen's children! 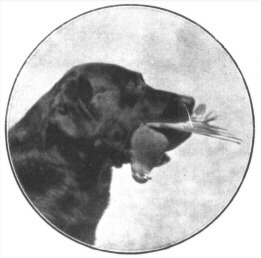 The St. John's dogs were very eager to please and their retrieving abilities made them ideal for hunting companions and sports dogs. The exact origin of the Labrador Retriever is unknown, but some speculate the Greater Newfoundland dog, or the French St. Hubert's dog is part of the cross that made the St. John's dog. The wonderful temperament of the Labrador Retriever is documented back to it's early days in England and has made them ideal family pets. It was in the early 1800's that the first dogs were imported to England to a few aristocratic British sportsmen. In 1809 the Earl of Malmesburg at Heron Court had used his St. John's dog for the shooting sports in England. 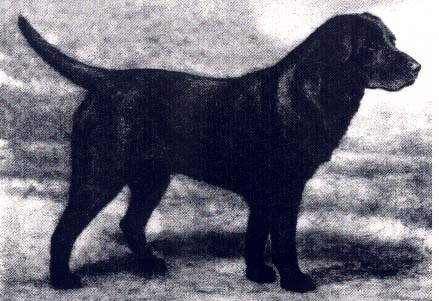 The second Earl of Malmesburg was born in 1778 and was the most influential person in keeping the Labrador Breed alive. He started the first kennel of Labradors. He kept his kennel well stocked until his death in 1841. The fifth Duke of Buccleuch started his kennel in Scotland around 1835. 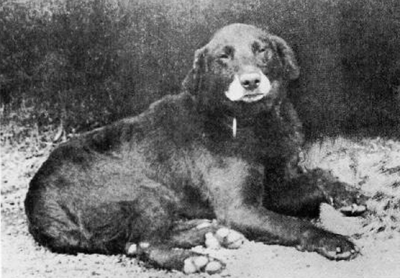 The dog was first documented under the name Labrador in 1839. The territory of Labrador is just northwest of Newfoundland. The 19th century Brit's lumped that area together as the same land mass, so it could have referred to dogs from that area, hence the name Labrador Retrievers. The Duke's brother Lord John Scott also started importing the St. John's dogs from Newfoundland. The earliest photograph of a Labrador Retriever was of Dukes dog Nell who was born in 1856. The photograph of Nell was taken in 1867. 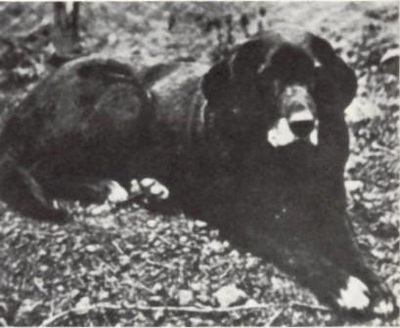 This St. John's dog was part of the breeding stock for the Labrador and had white feet and a white muzzle. 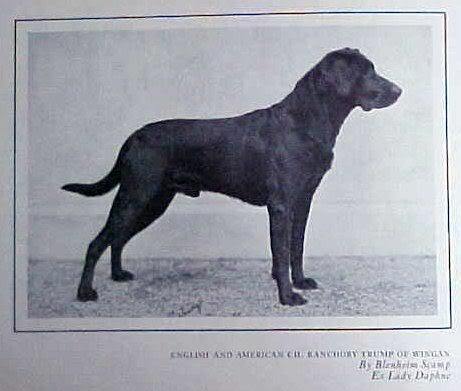 This trait was noted in some other Labradors being bred in the 1800's in England. Sometimes as the present day Labrador ages you will notice that areas that gray tend to be the paws and muzzle. Perhaps a left over of the St. John's dogs? 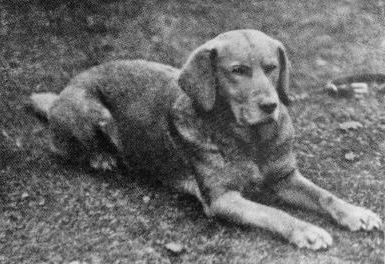 Then by the 1880's nearly all the true Labrador (St. John's dog) lines had died out in England. A fortuitous meeting of the third Earl of Malmesbury (at age 75) with the sixth Duke of Buccleuch and the twelfth Duke of Home saved Labradors from extinction. Malmesbury gave them some of his dogs to carry on the breeding program. Malmesbury had kept the bloodlines as pure as he could with the imported dogs from Newfoundland. 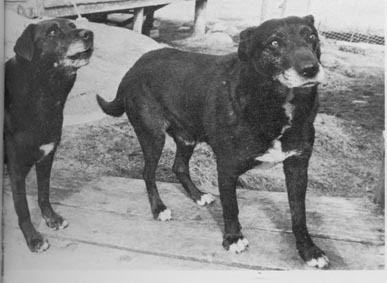 The two dogs names were Ned (born 1882) and Avon (born 1885). It is believed that these two dogs are the ancestors of all British Labradors. 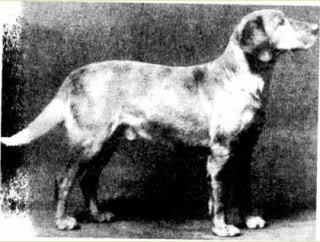 Buccleuch Avon is said to have sired "liver-colored" pups in 1892. These dogs would be the ancestor of most chocolate American Field Champions. 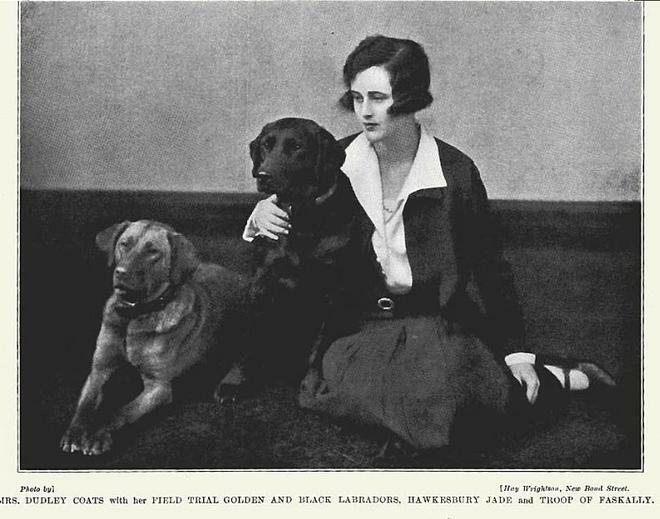 In 1899 the first recorded yellow labrador was born at the kennel of Major C.J. Radclyffe and named Ben of Hyde. In Newfoundland the St. John's dog eventually became extinct. In 1903 the Labrador Retriever was popular enough to be recognized by the Kennel Club in England. In 1916 the Labrador Club was formed in England with support from Lord Knutsford (Munden Kennel line) and Lady Loma, Countess Home (Banchary Labradors). Some chocolate Labradors are said to trace back to FC Banchory ?night Light from the Banchary Kennel. He was a black dog born in 1932 in England. Night Light comes from the line of Dual Ch. Banchory Bolo (1915) who appears to be a carrier of the chocolate gene from Buccleuch Avon. Banchory Bolo was also known for carrying a trait of white hairs under the feet (Bolo pads). 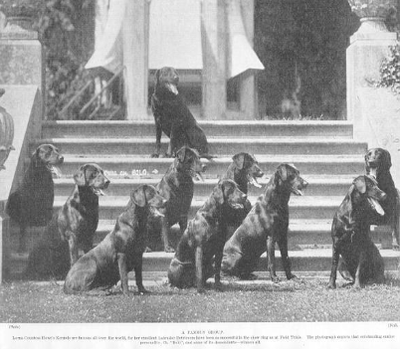 A group of early Buccleuch Labradors, including Avon, Ned, and Gyp are pictured. Sir Arthur Holland-Hilbert and his Labradors including Munden Sentry and Munden Single circa 1911. 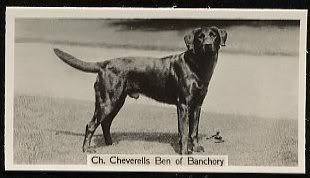 English Dual CH Banchory Bolo(1917-1925) and 2 notable descendants are pictured above. 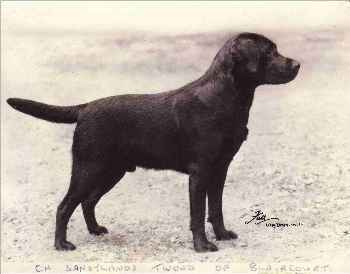 From the 1920's through the 30's there was an influx of British dogs into the US, heavily influenced by bloodlines from the prestigious Sandylands Kennels which registered with the English Kennel Club in 1931, that formed the backbone of the breed in this country. Gwen Broadley at her Sandylands (Shotton) Kennels -1930's. In 1917, the American Kennel Club also officially recognized the Labrador Retriever as a distinct dog breed. Today, the Labrador Retriever continues to win the hearts of people, young and old. They are not only great family dogs but they are also top choices when tracking, retrieving, and hunting. Labrador Retrievers have also earned a niche as a guide dog for the visually impaired and as service dogs for the disabled. If you’ve spent any time reading or talking about Labs, you have almost certainly come across the terms "American Labrador’" and "English Labrador". But what do these terms mean? How did these terms come about and become commonly used? Is one type better than the other? Neither the UK Kennel Club nor the AKC allow in their standard or recognize the difference between American and English Labradors. They simply do not differentiate between Labs - there is only one Labrador Retriever Breed Standard. Labradors bred especially to hunt and compete in field-trials are selectively bred for their working abilities. High energy and drive, athleticism, and agility are the most desirable traits in a working Labrador. They’re bred with far less regard for conformity to the breed standard and more for their ability to perform than a Labrador bred for show and are now identified by breeders as the American Labrador. Labradors bred for show in conformation competitions are selectively bred for a specific "look", with the Labs most closely matching the judge's interpretation of the breed standard and winning awards in the ring going on to be used in breeding programs. Their ability to perform in hunting and field trials is secondary, at best. They are mostly identified by breeders as the English Labrador. 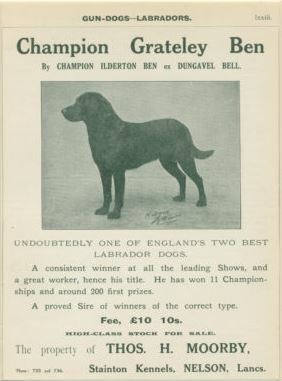 At one time, a Labrador's conformation and working ability were equally important, with many breeders aiming for the prestigious "dual champion" that would win in both the show ring and out in the field. Here at Smithpoint Retrievers, are working to re-establish this great tradition. We own both "types" of Labrador Retrievers and some are combinations of both, and we are aiming to produce the ideal Labrador Retrievers that are both beautiful and retain their athletic abilities! We want labradors that will swim, retrieve and not just lay around the house looking pretty!